New Menu: We improved our menu for easier, more efficient browsing. We have posted so far 170 posts, including 66 experiencers stories. We apologize for the inconvenient encountered with our previous menu, as this site is a first experience for this apprentice webmaster, learning the skills with the practice. With this new menu, navigation of the site and browsing of posts by categories is made easier. In 12 weeks, we have received nearly 16,000 views by 5,600 visitors from 91 countries. Although the network has kept growing and reaching out to an ever wider audience, the two weeks I spent on the road this month on my journey to the gathering on the coast, held me from working online and posting, so the traffic dropped with the activity. MARCH: 5,900 views; 1,600 visitors; 153 likes. APRIL: 5,900 views; 2,300 visitors; 167 likes. MAY: 4,100 views; 1,700 visitors; 92 likes (with 8 days still left in May). There is a growing number of circles and events worldwide to promote and facilitate peaceful interspecies communication. On this side this month, I gave a workshop at the international shamanic gathering Fire in the Winds, in Squamish, BC, lasting a week. I took part in two traditional sweat lodges, with another one coming this weekend, where Native Elders shared openly their knowledge about Sasquatch and Star Elders. 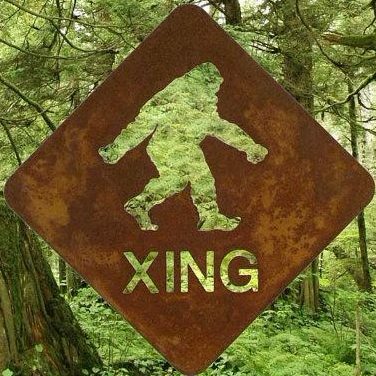 I met another Sasquatch channeler who knows the local clan of Hairy People, as well as other local Sasquatch and Star Elders communicators whom we should meet shortly. Manifestations have been ongoing, with star ships landing nearby, one that I filmed. My host and friend had his first Sasquatch experience, after years of interest and studies. We are developing a network of people involved and interested in interspecies relations. For a third night in a row, a star ship landed on the mountain behind here. Tonight I did not have time to get my camera, but Jules and Susan also witnessed the phenomenon. SPREAD THE WORD: Share our links in your networks and with your contacts. You can share any (or all) of our pages and posts by clicking on the ‘Share’ buttons at the bottom of the pages, to social medias (Facebook, Tweeter, Google) or on WordPress for bloggers. SHARE YOUR STORIES: There are very few platforms online where experiencers can openly share their encounters in safety and if they wish, anonymously, for the collective education. Please consider sharing your stories of encounters and interactions that can inspire peaceful spiritual interspecies communication, by clicking on ‘Submit stories‘. LIKE OUR POSTS: Every post comes with a ‘Like’ button a the bottom. It is easy and quick to click on it. Every ‘Like’ from our readers is an encouragement to keep giving our best. VOTE: You can show your appreciation by voting between 1 and 5 stars on every post, just under the titles of articles. Please, help us to get a good rate and fair score. Thanks. COMMENT: We are aiming at making our website as interactive as possible and appreciate everyone’s input. Please leave comments, if you appreciate our posts. DONATE: We are sincerely grateful to all our donors who make our work possible. Without your contributions, we could not be dedicated full time in spreading the awareness of our interdimensional Cosmic Family, or travel to events to teach. In the last 3 months we have received $535 by 13 donors on Paypal and $615 by 12 donors on GoFundMe, for a total of $1150 by 25 donors. Thankful gratitude to all. Your donations go to cover traveling expenses, transportation, maintaining a working place, and eventually towards computer and camera equipment upgrade and a vehicle. Our fundraiser on GoFundMe went well for the first month, but then it was frozen for over a month by the server for technical problems, which have been corrected since then. Although it has been dormant for weeks, please help us to keep it going all year. Beauty of human lies within the eloquence of the tongue. Words are precious, they aren’t wasted. Words have a direct and powerful consequence, like magic.